Previous long running #1 and first page puppy class search hits on Google and Yahoo! Pictured is my former north Howell training center. Welcome and thank you for your interest in my Puppy and Obedience Training classes! minimums and maximums. Thus, register early to avoid disappointment, thank you! Pawformance Sports! Rally-Obedience & Recreational Agility for pups and people that enjoy special time with their pup! Brighton Community Ed- if schools are closed, our evening classes are cancelled. Howell Area Parks & Rec - "When after school activities are canceled for Howell Public Schools all enrichment classes are canceled. In the event of a snow day we will make a decision around 1pm whether to cancel classes or not." Call 517 - 546 - 0693 to inquire. Getting sass? Shy or anxious pet? No problem, sign up for a "Results" puppy or dog training class! With the right coach at your side, you may relax! In addition, 'paws' don't like to be hungry always hoping for a treat... Let yours learn to relax and enjoy life, too! Trainers attending recent puppy and dog training classes are from: Brighton, Byron, Commerce (one Commerce trainer with a dog from Royal Oak), Durand, Fenton, Flushing, Fowlerville, Green Oak Township, Hartland, Highland, Holly, Howell, Milford, New Hudson, Novi, Pinckney, Plymouth, South Lyon, Walled Lake, West Bloomfield and Whitmore Lake! Trainers have attended from all over SE Michigan, Ohio and a guest from Northridge CA (ok, she did *not* make a special trip to join us)! Class attendees in addition to the above: Allen Park, Ann Arbor, Birmingham, Canton, Chelsea, Clarkston, Dearborn Heights, Drayton Plains, Farmington Hills, Flint, Frankenmuth, Garden City, Keego Harbor, Leonard, Livonia, Melvindale, Northville, Ortonville, Pleasant Ridge, Rochester, Rochester Hills, Rockford, Royal Oak, Southfield, Trenton, Ubly... Thank you to all for your travel time and trust in my program. Thanks for making it a nice atmosphere to learn and practice... it was FUN. You will find the most complete class information and schedule here on my web page. (Do note I am in the process of rewriting copy, moving away from 'third party'.) Basic class information and how to register are listed in the Brighton Community Ed and Howell Parks and Recreation Authority brochures when offered. While most participants find us through referrals, an occasional ad will be ran in the Marketeer shopper guide, Fowlerville News & Views and Hartland's Community Life newsletter. Watch for local advertising featuring a puppy picture of Golden Retriever "Spirit". Referrals are noted on the "News Referrals" along with the Trainer's Bark! newsletter. All Puppy Training Classes are NOT the Same! My Puppy Class is *not* a wild party! It is structured with monitored social time. If you are debating about registering for Puppy class or waiting to start in Obedience & Manners One, read the following. This note is from a Results trainer who beginning in the 1980s has trained four dogs with me, all starting in the Obedience & Manners level. Her current new pup "Rio" is the first to do Puppy class. Note - "Rio" is an active, confident, respectful and happy Labrador Retriever! Hi Mary! Thank you for all the info ... I am really glad we were able to go through the puppy class! It has made a huge difference! When I call her with the come command from across the yard, she comes running. She also has a respect for me that the other dogs did not have until later. It really is an important class for building the foundation for future training. �And it's just right, it doesn't expect too much from a puppy, but definitely does build the respect. I'm loving my time with her! ...Thanks again! I will practice with Rio during the summer, and look forward to om1.� Gail B. From Amy & "Griffey" - Golden Retriever and Standard Poodle: While searching for a puppy class for her new puppy, Amy was disappointed with what she was finding. Upon a referral from her vet at South Lyon Animal Clinic, she said finding my Results program was a "Breath of fresh air!". Thank you Amy and Dr. Weber! More comments along with class rosters are noted on my Trainer's Bark Newsletter. Use the "News Referrals" link found at the top of this page (blue rectangle). Much Experience! 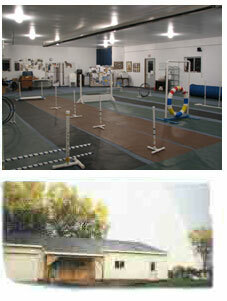 In Livingston County since 1981, Results Puppy and Dog Training & Pawformance Dog Sports! From the litter to your best friend... Training director and instructor - Mary T. Ratelle. My background link is at the bottom of this page. Offering pet owners a unique hands-on, praise reward program for companion dogs. This approach is based on building a relationship to help your pet gain confidence and self esteem with manners - not clickers & treats, toys, electronics or remotes! While enhancements to my program have taken place since the early years, my base has stayed the same - because it works! Praise is the best 'positive' training, as you always have it with you and there is no need to keep your pet 'hungry' (not very positive from a pet's view) so it will (hopefully) perform for a treat! This Results simple and efficient approach works best when started with a puppy, however Results may be attained with older pets, too when mutual respect, responsible care and fulfilling exercise needs are provided. Proper handling in between structured leash training sessions is just as important as teaching responses to commands. Thus, the first class is for trainers and their mature household members, the pets stay home! If you are new, be sure to read the Program & Class Information page. The use of food for sits, downs, comes and stays is simply not done! Please note when reading my handouts, praise reward! Even after following a very nice orientation with demonstations it is surprising to me that some trainers come in choosing to train at their pets instead of bonding with them ... using food and/or signals - even when pets are not responsive! Keeping the focus on the trainer is most important, not teaching the pets to watch the hand, pocket, bait bag or mouth hoping for a snack or toy! Treats are used for leash training puppies in Puppy and Conformation show (when offered) classes only. Treats are also used for housetraining (potty outdoors), crate training, bed time and just because! After basics and manners are learned, treats may be used in O&M Two and Three for an occasional exercise. Dog sport interest? . Not surprising, this practical program for companion dogs offers a wonderful base for many dog sports! Trainers desiring to do more with their pets in many venues usually find that attaining titles happens with ease when compared to the pets that have the shock of no treats when in a ring or on a course. Take a look at the "Awards" page, link is above! If advanced training with your dog sounds like fun, join us for recreational and/or competition training. Especially nice to do with like-minded, drama free people! After base training, the Obedience & Manners Level 3 & 4 - Pawformance Dog Sports! year round classes take training to another level! Terrific for dogs that need a job! I have been called a dog whisperer for decades because I 'know dogs'. I do not follow the current media trends of 'dog whisperer' labels that may be a hyped business lure or fabricated drama attention getter. I believe that true dog whisperers do not need to rely on dysfunctional methods, keeping a pup hungry so it will respond to a treat, harsh handling, nor does a person need to yell or shout. I have been told by many that I can bring the best out of any dog. I am not certain about that, but I am certain that I do try my best! One of my favorite compliments received is how happy my dogs are! See the quick read below... To view more comments, visit the 'News Referrals' page, a link is at the top of this page. 'Dog Whisperer' Tames Wild-at-Heart Canines. Prior to my move (and retiring again), my Puppy page was a long time non-paid for 'Puppy Class' #1 search of over 1,000,000 Hits! Longtime member of the Association of Professional Dog Trainers. Champion Shaggyluv Chelsea's Touch'e AKC Companion Dog (CD), Rally-Novice (RN) and Therapy Pass. Multiple best of breeds over the Westminsiter winner of the year from the puppy class - always owner handled! Past professional handler - Best In Specialty and multiple Group placements with various breeds! Past AKC Canine Good Citizen and Therapy Dog International evaluator. Past long time contract writer for the Detroit News - Kennel & Bench. Results staff featured the first ever AKC Canine Good Citizen Test in Michigan which was held in conjunction with Howell's Balloonfest! Past Ears for the Deaf - Paws With a Cause - Field Trainer and Presenation Coordinator and SE Michigan Assistant Director. Trainer of the first certified hearing dog in Livingston County! Most important - class instructor for many with happy, well-behaved companions! Caution: Fraud alert! The Results Dog Training name, handouts and advertising material and even a previous address (!) has been used by others doing in home consultations, personal training and other group classes. Note I, Mary T. Ratelle do all instruction, staff is not employed. If my name is used by another, do not write a check! Do get pertinent information, copy driver license if possible and get license plate information. If possible, take a picture! Please advise if you receive material with my name. Thank you! If after reading the info on my web site you still have questions, please feel free to contact me: Training Director - Mary T.
To help prevent issues, please read this article, even if you do not have children. Your pet(s) may be around younger people visiting at your home or when pet are away. Wild Walk Gardens LLC I also enjoy designing gardens and natural areas with an emphasis on using Michigan native plants and 'wild' flowers! Training personal dogs since 1967. Showing purebred dogs since 1971. Agility field at my previous location. "Pawformance" Sports! (PDS) agility started with the USDAA in 1992 and soon after UKC, before AKC! Warning - training here can be habit forming - people and their 's have fun! !